"If you like the peppered beef jerky in the bag, you will absolutely love this." Place beef strips on a solid, level surface. Firmly pound beef with the tenderizing side of a meat mallet until the meat fibers are slightly broken but the strips still hold their shape. Mix Worcestershire sauce, soy sauce, brown sugar, onion powder, garlic powder, black pepper, liquid smoke, cayenne pepper, and coriander seeds in a large bowl until brown sugar has dissolved. Place beef strips into the bowl; add enough water to allow marinade to cover the meat. Stir to incorporate water and submerge the beef in marinade, cover the bowl, and refrigerate for 24 hours. Remove beef strips from marinade, shake off excess, and lay the strips onto oven-proof racks. Do not overlap the strips. Bake the beef strips in the preheated oven until an instant-read thermometer inserted into the thickest strip reads at least 150 degrees F (65 degrees C). Remove strips from oven and place onto racks of a food dehydrator so the strips don't overlap. If desired, sprinkle strips with more coriander seeds and black pepper. Turn on the dehydrator, set machine's temperature for 155 degrees F (70 degrees C), and dry the jerky until leathery, about 9 hours. Rotate the racks from top to bottom every 1 1/2 hours for even drying. A piece of jerky should crack but not break in half when folded. Store in refrigerator. 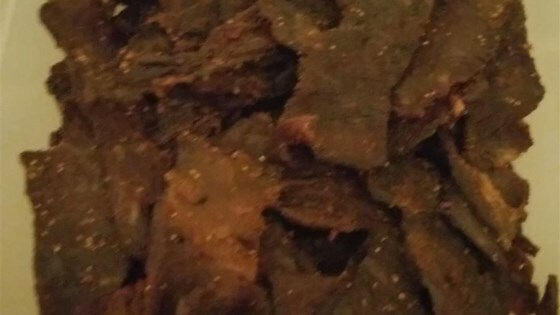 See how to make beef jerky from scratch in the oven or a dehydrator. Store in zipper bag. Keeps well in refrigerator for up to one month. When I submitted this recipe step 6 was not included. I use only my dehydrater for drying and not the oven, this is why the time may be shorter. no changes, will not do this one again just because it was too peppery for my liking. Could try it with less pepper. Very good but a bit too sweet for my taste. Will make again but alter the sugar quantity and really lay on the pepper next time. Made this with elk and let it marinate for 24 hours. Really tasty recipe. Husband and work friends loved it.